These ice chests are each hand made here in Texas from old weathered "barn wood", not stained wood and will continue to maintain their "aged" look for many years. As a result there are no two exactly alike. The adornments on the STAR model include a large Texas Star logo on the front, a handle, two horseshoes on top of the lid and an old-timey bottle opener! Inside is a 1 1/2" thick styrofoam enclosure which fits in the lid and box perfectly for a tight, cold-enclosing fit, including a handy drain feature. We do not use a non-insulated metal liner. 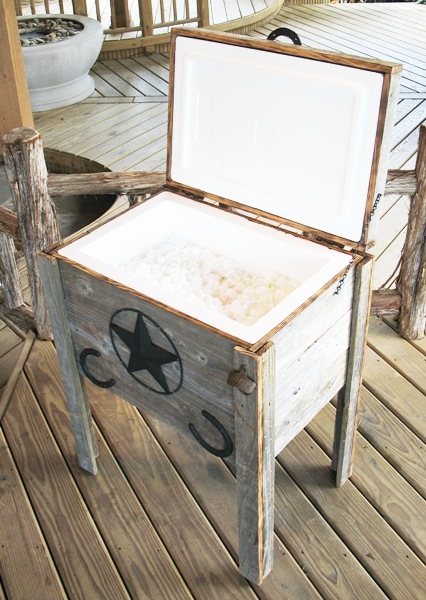 These "barn-wood" style ice chests add that rustic old charm feel to any outdoor gathering. All wood is lightly sanded for a more even, smoother and better looking finish. Also available are double ice chests, bars and trash containers that are made the same way to compliment one another. No need to worry about the wood fading IT ALREADY IS! The materials are what is commonly called "barn wood" and are in fact very old materials but still very useful and strong. I guess you could say we're sort of recycling this stuff! All of the decorative hardware is actually rusted, then, poly-coated so it will not rust any further or get on your hands. You could say this is a new, old item! Buy it as shown or customize it with our wide assortment of decorations to create your oun unique look! Approximate dimensions are (remember these are hand-built so it will vary a little from piece to piece) 32" tall, 25" left to right and 17" deep. Go ahead and get one, you'll be glad you did and your neighbors will be jealous! Our boxes may cost a little more, but, they look better, last longer and are more efficient.